Greetings! Thank you for stopping by! Zeyek's BIONICLE: Untold is my latest Internet venture, a log of fictitious stories I created to breath a little extra life into my newest hobby, building Lego Bionicle MOCs ("My Own Creations," literally just custom builds). 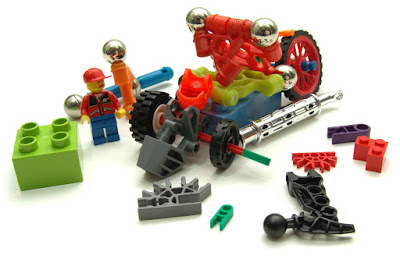 Speaking of stories, allow me to tell you the completely true story of how I got into Bionicle building to begin with. I originally played with Legos as a young child. In fact, the very earliest set I remember having was #6383, Public Works Center, at the turn of the 1980's. I did a bunch of tinkering, but eventually moved on to bigger & "better" things like slot cars and HO scale trains. It wasn't until the turn of the 21st century that I made a long-overdue return to the wonderful world of Lego, using over 12,500 parts to build a long cityscape display along a wall at my place of work. You can see more about all that at my homepage. I pretty quickly took the plunge into Technic, eventually buying two original Mindstorms sets and several of the add-on packs to mess around with autonomous vehicles & walkers. Just when I was picking up steam with the 'bots, though, again I took a detour, this time getting into pro-level radio-controlled (R/C) racing & engineering (more about that on my numerous RC sites). All of the Mindstorms stuff went up on eBay, and my remaining System parts went into buckets to collect dust in the garage while I went off gaining a little bit of fame & fortune in the surprisingly vast & vibrant RC world. In early 2009, I was working as a senior designer at PayPal. You know, PayPal, that site you can use to pay for stuff on eBay & thousands of other places, or to send money to friends & family online. 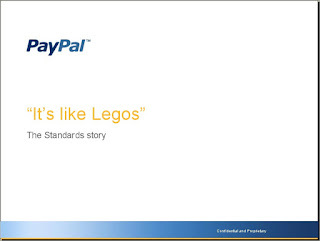 I had taken on the task of designing small pieces of web pages (we called them "standards") that could be assembled together to build complete pages and even whole new PayPal products. It was kind of like designing Lego blocks, and teaching people how to use them. Well, there came a point where I had to give a big presentation to over 100 people in my department to explain what I was doing and why it was going to make all of their lives better. Rather than doing the usual boring, dreary, endless PowerPoint slides full of text that just put people to sleep, I decided to use a Lego theme and present almost exclusively with colorful pictures that I'd narrate in free form. Out of the garage came the buckets of System pieces at last, and I even made a trip to Toys R Us for some newer additions. I created & photographed all of the scenes for the presentation over the course of a weekend, and it was a raging success. One of the lessons I wanted to teach in this presentation was that for a building block system to work, all of the blocks have to be from the same system. 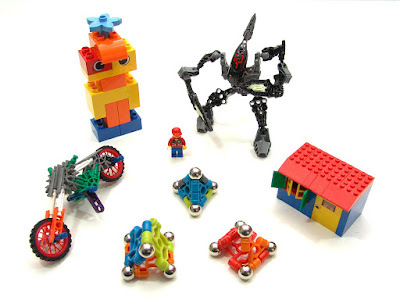 To put this in picture form, I made a couple of scenes featuring parts & creations from different construction toy sets, including Lego System, Duplo, K'Nex, and Magnext. I also threw in a Bionicle set for kicks, because it was cheap and, to the untrained eye at least, its parts clearly wouldn't play well with the others. I actually took some evil pleasure in poo-pooing on the idea of Bionicles in addition to the other non-Lego System parts. 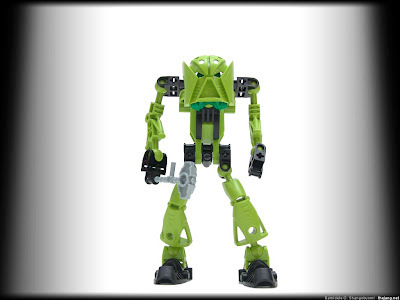 You see, I always hated Bionicle. I hated the whole concept. I saw the original sets in stores back in 2001 and they infuriated me with their special parts and departure from the classic interlocking brick setup that made Legos, well, Legos. To me, any Lego product that wasn't strictly based on the brick system was blasphemy, taking creativity out of one of the most creative toys ever devised. 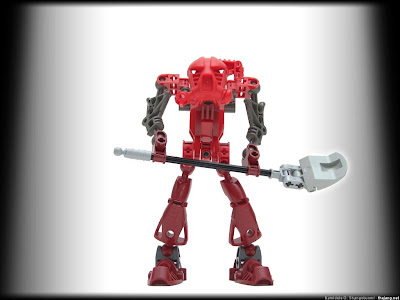 The particular Bionicle I picked to use in my presentation was the Agori Atakus, from the Bara Magna storyline. I got Atakus in particular because at least the assembled figure looked pretty cool, if you could ever get past the fact that it was a Bionicle and thus a disgrace to the world. It looked cool enough, in fact, that after the presentation, I brought it in to work to add to the decor of my little area of the office. Bad move. Within a few weeks I had bought yet another one of these evil things, Solek the Matoran this time. Then I picked up a Zesk. When I next bought Tarduk, I recognized that I had the start of a collection on my hands. 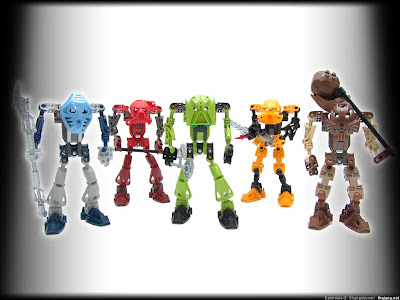 At the same time, my originality instinct started kicking in hard-core, and I itched to create some custom Bionicles, though at that point I had never so much as heard of the term "MOC." 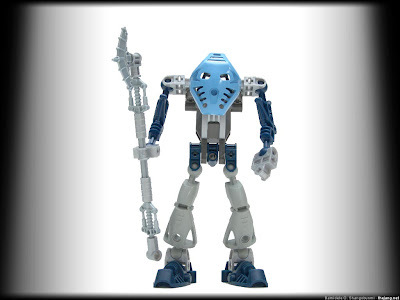 My next Bionicle purchase was on eBay (and paid for with PayPal!). This time instead of buying a set, I bought five or so. Pounds. 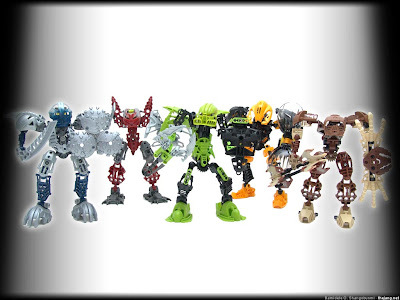 It was the partly-assembled Bionicle collection of some kid who had already outgrown them. Then came another 5 or so pounds, and another 3, and another 7. By the time I slowed down purchasing these big lots of parts, I had more legs, heads, and ball socket pieces than I thought I would ever be able to use. In the meantime, I had disassembled all of my pre-built sets and done my first dozen or so MOCs, and the rest was history. As of this writing, I have nearly 60 custom creations ranging in height from 2 inches to 2 feet. 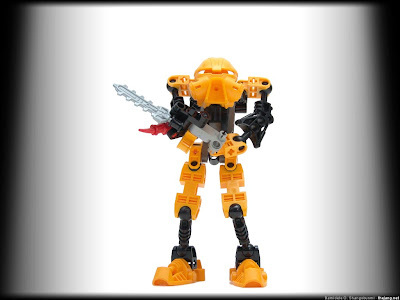 Some of these builds are my own personal takes on official ("canon") Bionicle characters, but most were completely made-up, so it was only natural that I would create unique back-stories for them. 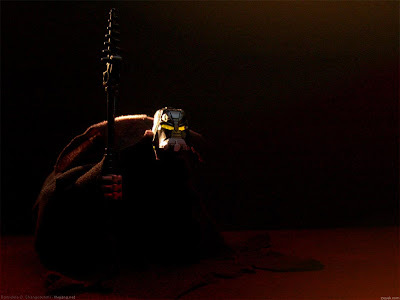 To avoid conflicting with any of the official storylines, I've devised some new planets and new timeline events, and you'll be seeing some well-developed new civilized races as well as species of Rahi, all told from the viewpoint of Zeyekti-Iiloptinous Mazzourel, the oldest of all Bionicle chroniclers. I hope you enjoy following my work even a fraction as much as I enjoy doing it! Please do leave comments! I'm unfortunately an unusually busy guy, so I won't always be able to directly respond to individual comments, but I can assure you I'll read every one, and you'll definitely be seeing some responses and follow-ups appearing in future posts. The planet is known as Rilovi. Its soil is incredibly rich with iron, magnesium, and sulfur, painting the ground a vibrant, burning reddish color. A warm world, its landscapes range from rocky deserts sprinkled with hearty plants to lush tropical rainforests. Snow and ice are only encountered at the northernmost tip of the planet, and for no more than one-third of the year. Across all of these groups ran one other axis of distinction between individuals, a class system that could most easily be recognized by differences in size. 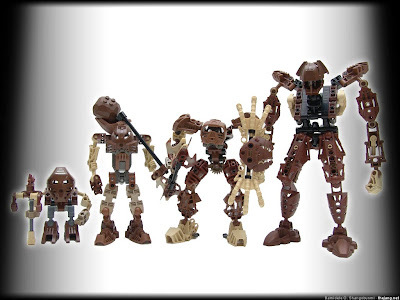 Like any typical Bionicle society, the majority of the population consists of upright-walking average citizens (of modest size). On Rilovi, these commoners had no particular title as a class, and the overwhelming majority of them worked in agriculture or construction. Warriors (slightly larger) were selected at a young age for their physical potential and trained to live a full, long careers of military valor. I will speak more of this class... later. Elders (smallest in stature) among the Rilovians were known for their wisdom, but not their knowledge. 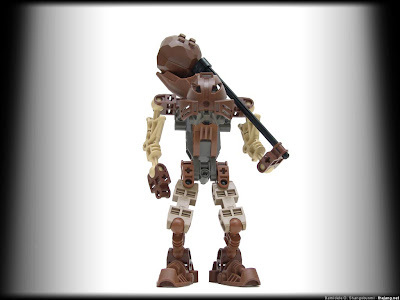 To use a term you may be more familiar with, these were no Turaga. With advancing age, their intellectual capacity receded, eventually rendering them... simple-minded, as some may say. This, though, was exactly what brought the elders the highest level of respect from all other classes. Their minds were pure, their thoughts uncomplicated, their decisions fair and unbiased. This made them natural leaders among the very moral populous, and elders served as judges, mayors, counsellers, and priests. Lastly, there were the largest members of Rilovian society. It was once estimated that for every 1,000 Rilovians in existance, a mere 3 were Giants. Though the smallest giant could rest his chin on the head of the tallest warrior, these were no brutes -- they were giants of intellect! These were the architects, the medical scientists, the inventors. With rich, fertile soil, a fantastic climate, and a myriad of motivated workers, the Bionicle planet of Rilovi provided ample food and a hospitable environment for every citizen that could set a foot upon the land. The problem was, there existed... too many feet... but not enough land for those feet to to set upon. No giant thoughts nor elder wisdom could prevent the inevitable border disputes, and as these disputes grew and itensified, they escalated to perpetual civil war. My name is Zeyekti-Iiloptinous Mazzourel. You may call me Zeyek... for short. 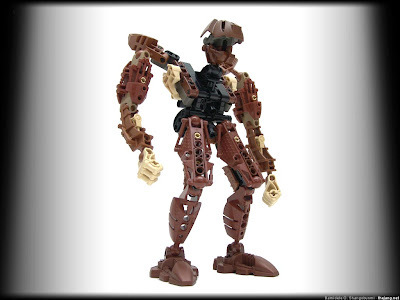 To the best of my understanding, I am the oldest living chronicler of Bionicle, though not the longest-living. I've died, you see. Twice. Minor inconveniences along the way, you might say. I have visited 113 planets and traversed seven different realities. I'm growing rather fond of this reality here. It is... peaceful, relatively speaking. I have been seeking out adventures, documenting events, and archiving histories for countless years, and I have divulged factual accounts to willing ears in numerous galaxies. Alas, I feel the time has come to disperse my gathered knowledge across a... wider audience. Gather here and I will teach you the untold legends of Bionicle, of other worlds and other races of beings. I will fill in some inconvenient gaps in the history you may already think you know, and I may perhaps even correct some blatant errors and misconceptions in popular lore. I do hope you will find at least some of this information useful, if not enlightening.